Wandering around Danvers Square last weekend, we were surprised and delighted to discover two terrific places for after-lunch treats, one newly expanded and one new to us. 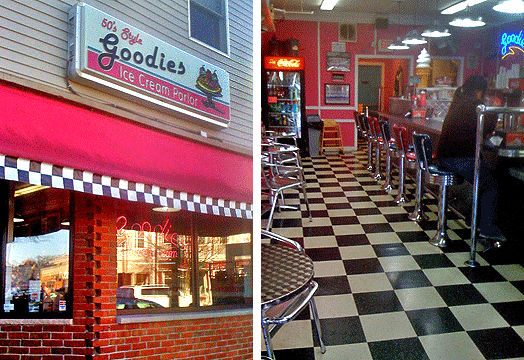 Goodies has been serving up ice cream for six years, but we’d never been inside and were delighted to find a 1950s-style décor with a wonderful selection of ice cream, soda-fountain drinks, and desserts. In addition to flavors like chocolate peanut butter chip, falcon crunch, and chocolate walnut, there is yogurt, sugar-free, soft service, and sherbet, plus fun candy toppings. We tried two seasonal flavors, including pumpkin (think pie) and apple crisp (with great caramel flavor). Prices range from $2.59 for an itty bitty to $4.61 for a large. We’re planning a return trip to sample some of the shop’s other offerings like freshly filled cannoli, churros, chocolate-chip-cookie sandwiches, and, of course, the fried dough sundae. Just down the street The Cocoa Belt is newly expanded, run by Theresa and Mark Whitman. Theresa was there with her adorable four-month-old the day we visited, and she couldn’t have been more welcoming. 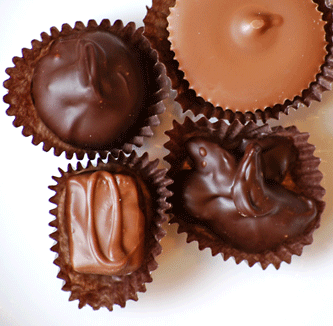 The shop features a line of fresh-made, hand-dipped chocolates ($21.95 per pound) that we found top quality and delicious, especially the coffee cream and the chocolate dipped fudge. The shop is known for delighting patrons with almost-lost traditional confections like scotch kisses as well as new traditions like black forest truffles and cranberry clusters. Theresa, whose love for chocolate might have something to do with growing up in the Nichols family, makes the chocolates in the couple’s Essex home and packages them in a workspace adjacent to the shop. The workspace is also where she holds birthday parties and candy-making classes for children and adults. In addition to Theresa’s confections, the shop features Lake Champlain bars in a variety of cocoa percentages and a line of letterpressed, hand-made cards. Both Whitmans are looking forward to their first holiday season in the new space, and we are looking forward to returning to support this talented entrepreneurial couple.